Our merchant partner has two new wine offers which will be of interest to Vinodiversity readers. Both packs contain wines from smaller producers and represent multiple Australian regions. The wines are all highly regarded. 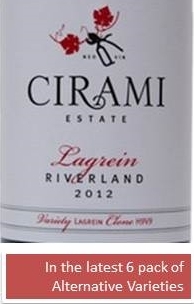 For example the Lagrein, made by Cirami Estate, won the trophy for Best Italian Red Varietal at last year's Alternative Varieties Wine Show. Different Drop, Vinodiversity's wine merchant partner offers quite a range of alternative varieties. Have a browse around for some other offers. Freight is a reasonable $9 for 6-packs, or free for orders over $150. Please note I get a small commission if you buy from Different Drop after following these links. Hope you are drinking some interesting wines. I hope to have some exciting news for Vinodiversity lovers next month.